At Passanante’s Home Food Service we know that utilization of the best products available is central to every memorable meal, but any food connoisseur knows that even the best foods can be reduced to average if the preparation isn’t on point. Having said that, grilling the perfect burger is an art form. Anyone can simply grill a burger, but it requires a whole ‘nother set of skills to prepare one with just the right amount of pink in the middle, the perfect level of delicious juiciness, and the critically important ideal patty size to fit the bun. We’ve gathered up a handful of tips from the pros and are gifting them to the world in an effort to reduce the frequency of average and below-average burgers. Enjoy & Happy Eating! Pack it loose & Make a dimple: Form the burger loose, and round out the edges. Finish it off with a thumb-sized dimple. This will prevent the burgers from turning into a ball. Use High Quick Heat: Getting a good sear on the outside, will keep all those good juices in the inside. Hold the Press! Resist the urge to flatten the burger with a spatula. Let it cook for 4-5 minutes then give it a flip. Minimize the Flip: The burger pros’ we see at the competitions flip only once, usually when they see the juices flowing on the top. After that, cook it for another 2-3 minutes, and you should be good to go. Let it Rest: Much like a good steak, take it off the grille and let it rest. This will make the juices saturate the meat, and prevent some over eager mouth burns. Remember with Passanante’s we’re all about options! 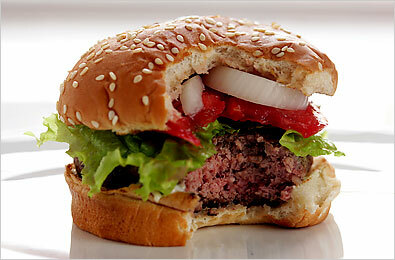 Jumbo Steak Burger: This delicious 6 oz burger is our staple. Real cuts of NY Strip, Sirloin, RibEye, and Filet, make this a standard for any cookout. 100% Sirloin Burger: Want big flavor, while keeping the summertime figure? Try our 5oz Sirloin burger. Juicy, delicious, and lean. Filet Brisket Burger: Our most decadent burger. The flavor of the Brisket perfectly matches the tender deliciousness of the Filet Mignon. Bon Appetite! Cheddar Bacon Pub Burgers: Stuffed burgers… Need we say more? D.I.Y. Ask about our Bulk Ground Meats-Beef, Bison, Chicken, Turkey, Veal, Pork – all of which are naturally ground without any added fats or fillers. Browse through all of them in our online product menu located on the products page of http://www.homefoodservice.com! This entry was posted in Beef, Recipes and tagged Best Burger, Food Delivery Service, Home Food Delivery Service, Passanante's Home Food Service by Passanante's Home Food Service. Bookmark the permalink.